In 2006, Hisham Mayet returned to West Africa to continue his search for an unknown musician he had heard six months earlier on the radio in a Morocco hotel room. Knowing only that it was Sahrawi music — music of the south — he headed down through the vast and remote desert landscape of the Western Sahara and Mauritania in hopes of finding someone who could identify these revelatory recordings. That artist was Group Doueh. But he also found much, much more as he wandered from Laâyoune, Western Sahara, to Mauritania’s capital city of Nouakchott: From intimate, sinuous home recordings by Group Marwani, to a sublimely devastating track by the enigmatic Abdul Rahman Al-Gheid, to the inimitable tidinit artistry of Sadoum Ouled Aida, the performers on this album exemplify the haunting and intoxicating qualities of Sahrawi music. 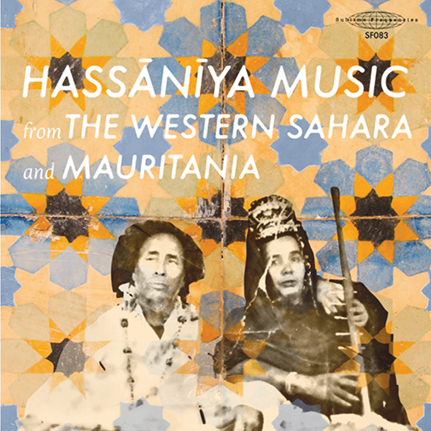 Featuring Mayet’s first recordings of the electrifying Group Doueh, as well as dizzying field recordings from Nouakchott’s Marché Capitale — where relentless traffic noise swirls together with fragments of melody from countless cassette vendors’ PA speakers— Hassānīya Music from the Western Sahara and Mauritania is the evocative soundtrack to a chimerical journey that is also documented visually in Sublime Frequencies’ breathtaking film Palace of the Winds. It not only traces Mayet’s own passage through these barren and beautiful lands, but also charts the evolution of Sahrawi music from sung poetry accompanied by traditional acoustic instruments to electrifying modern grooves drenched in reverb and phase effects. Limited edition pressing with Stoughton tip-on full color gatefold jacket.